After being the lucky recipient of 35 grams of maltodextrin at one of Dani’s cooking classes this week, I couldn’t wait to try to make the Pine Nut Crumb. I tasted it at the cooking class and it was lovely – it sort of reminded me of malted milk milkshakes and maltesers all rolled into one…yum! Maltodextrin is made from tapioca and is incredibly light – so you need a lot to register on the thermomix scales. It’s also very expensive – a kilogram will set you back about $100 and take up a lot of space in your cupboard, so it’s a good thing to go halves or quarters in with a foodie friend. If I hadn’t had mine measured out so nicely, I think I’d be very careful with scooping out the maltodextrin straight into the thermomix bowl – perhaps put a small bowl inside the TM bowl, zero the scale and measure from there. I have found that my scales can be a little fussy sometimes, and if you add things slowly sometimes it doesn’t work as well as it could. I probably should just give the bench a good clean! The recipe is from Tomislav Martinovic, and he uses the pine nut crumb can be used on both sweet and savoury dishes – if you’re using it on hot foods, spoon it beside it rather than on top of it, so it doesn’t melt until you eat it. I’ve made this batch because I’ve got an itch to scratch, and it keeps well in an airtight container. This was the first time I christened my candy thermometer too. Not sure it works all that well, so I might be back to the shop with it. It wasn’t that accurate, and so I did the ice water test – and sure enough, the caramel was ready to add the pine nuts to. So I guess the lesson is, trust your instincts! If I’d have waited for the thermometer to reach 160 degrees I’d have ended up with a burnt mess – and had to clean up a horrifically messy saucepan into the bargain. In total, the pine nuts, sugar, glucose, cream and butter have made about 560 grams of caramel. You only need about a quarter of this for the crumb, and you can enjoy the rest with a cup of tea, on ice cream, or hide it in the back of the cupboard and forget to tell the rest of the family about it! I think that’s my preferred option – it’s lovely! I used a lamington tray lined with silicon paper to pour the caramel out onto. There was plenty of room. I had to smooth it out a little, but it doesn’t really matter what it looks like I guess. To break it up, I dropped it on the granite bench from a little height to get a few large chunks, then took to it with a rolling pin – a few short sharp whacks is all it needs. You can experiment with other kinds of nuts with this recipe, hazelnuts, brazil nuts, macadamia nuts perhaps. The limit is only your imagination. I’ll be using this over the coming weeks on all manner of things, so I’ll keep you updated with what I’ve used it with. So, this is a bit of a white elephant – the only reason I made it the other day was that Dani had mentioned that the Pea Soup was nice with the parsley oil! I had a little extra time up my sleeve today, and as it only takes 15 minutes (plus draining time) I was able to do it. It has the most beautiful parsley flavour – it really is like eating parsley! It’s a piece of cake really – some neutral oil and some fresh parsley. I used Italian parsley, but I’m sure other parsley would work just as well. Chuck it in the thermomix and blend away – be warned though, this is a bit of a noisy recipe, which surprised me! It’s just that the thermomix is on a high speed for quite a long time – so if you’re anything like me – put in your iPod or leave the room! I actually turned the speed down for a while when it was really doing my head in – but I am a wimp! Don’t be alarmed if the temperature goes up past the temperature you’re cooking the oil at – mine certainly did and it didn’t have any adverse consequences. There will also be vapour coming up from the lid – so don’t worry. 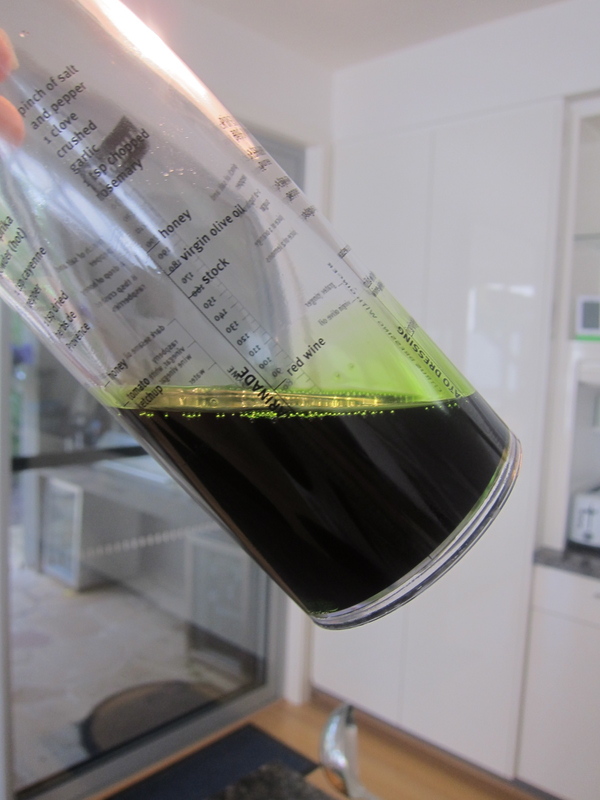 The result after 15 minutes is the most beautiful deep green oil, which you then filter. I didn’t have any muslin or coffee filters, so I used a clean chux wipe, which worked – but only just. I’ve ended up buying coffee filters today and have filtered it again so it’s very, very clear and with no sediment at the bottom. 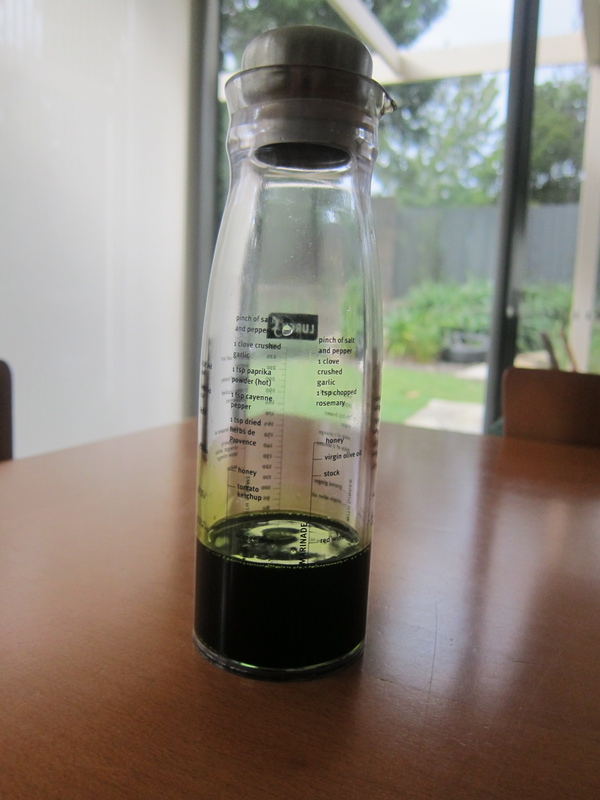 A word of warning to the eager beavers though – don’t put your oil into a jar or bottle that is not absolutely, positively dry – otherwise you’ll end up with water at the bottom of your oil, which not only doesn’t look great – but would probably shorten the shelf life of the oil. Another little word of caution – the oil can stain your hands if you don’t wash it off quickly – so watch out for pale coloured bench tops!! This oil would also make a lovely gift for a culinary friend – so once the parsley I am growing in the garden is in profuse supply, I’ll make this again.